Pantelis Leptos said that that while investor interest in real estate on the island is unprecedented thanks to the state’s efforts, the government is ready to discuss ways to speed up the issue of Title Deeds. Leptos who was commenting after a meeting with President Nicos Anastasiades in Nicosia on Monday, said that while the real estate market was out of the woods and the situation was currently better compared with three years ago, there is still way to go to improve the quality of the services and the product offered by Cypriot developers. 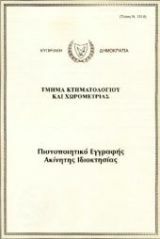 The chairman of the business group told reporters following the meeting, also attended by Interior Minister Constantinos Petrides, that he discussed “the matter of the timely issue of various permits to avoid delays and the overhaul of the Title Deed issue system,” according to a message emailed by the Press and Information Office. Delays in the issue of Title Deeds to buyers, usually resulting from town planning violations by developers or outstanding in their financial obligations, has tarnished the reputation of the island’s builders abroad. Government policies, such as the Golden Visa scheme which allows investors to acquire either a Cypriot passport or a permanent residency and tax breaks and town planning relaxations, have helped increase both demand and supply on the real estate market as well as construction activity. A study carried out by the CLBDA, showed that outsourcing preparatory work required for the Title Deed issue, such as permits and certificates, to the private sector, could help both property buyers and sellers. The government’s reaction to the proposals of the CLBDA, whose deputy chairman is Yiannis Misirlis, son-in-law of President Anastasiades, was very positive, Leptos said that added that there will be further meetings with the interior minister and officials of relevant government departments.